SingTel has deployed Multiprotocol Label Switching-Transport Profile (MPLS-TP) as the foundation for its ConnectPlus E-Line service, which provides up to 10 Gbps of Ethernet connectivity for multinational corporations. SingTel is using the Cisco MPLS Transport Profile (MPLS-TP) suite of Carrier Packet Transport technologies for this global deployment. Cisco said its Carrier Packet Transport solution provides SingTel with a network that unifies both packet and transport domains, while providing a greater degree of freedom in terms of network topology demands regardless of its customers' locations, traffic conditions and bandwidth requirements. 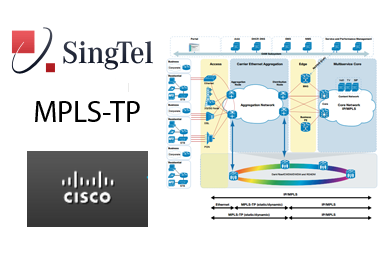 SingTel is one of industry's first standards-based MPLS-TP deployments. MPLS-TP also brings predictable resiliency and simplicity to service provisioning. "The video, cloud, and mobile services are defining new meshed traffic patterns and placing unprecedented demands on the transport network architecture. In deploying the Cisco Carrier Packet Transport solution, SingTel is able to simplify service fulfilment complexity and evolve the ConnectPlus suite of services into a new generation converged transport architecture ready for enabling future services," stated Jeff White, Vice President for Cisco's Service Provider Business in Asia Pacific, Japan and China. Alcatel-Lucent is expanding the range of open source cloud platforms and networking equipment vendors supported by its CloudBand "carrier cloud" solution. CloudBand, which Alcatel-Lucent first unveiled one year ago, is its foundational architecture for a new class of carrier cloud services, such as IMS or video applications, that leverage generic compute resources deployed in regional data centers throughout a carrier's footprint. The goal is to make the carrier infrastructure more agile, elastic, resilient and application-aware. Alcatel-Lucent said CloudBand gives service providers the flexibility they need to introduce carrier cloud services while benefiting from their existing investments in network infrastructure. The company has adopted an open approach to integrating best-of-breed open source cloud computing software. This includes support for the OpenStack Foundation, which was co-founded by NASA and RackSpace and is dedicated to open cloud development throughout data centers. 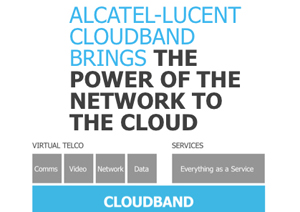 Alcatel-Lucent's CloudBand is also supporting Apache CloudStack in the CloudBand Management System, as well as Amazon's Elastic Compute Cloud (EC2). Alcatel-Lucent said it is now possible for service providers to remotely set up a networked CloudBand Node in just a few hours by accessing a pre-configured 'cloud in a box' solution. With this approach they can provide all the functionality of the public cloud wherever they choose in their network while offering the benefits of quality and security that come with the carrier cloud. "Openness has been a key principle that we have embraced to ensure that our customers' cloud environments can be adapted and expanded as the customer demand evolves. We have delivered on this promise of openness with multi-vendor support at every point in the network and the cloud so our customers can enjoy flexibility in their investment decisions, choosing whichever vendor best meets a particular need," stated Dor Skuler, Vice President of Alcatel-Lucent Cloud Solutions. Alcatel-Lucent is pursuing an enterprise-scale Software Defined Network (SDN) strategy that goes beyond offering basic awareness of the applications running on it to a network that can make automatic real-time adjustments. The strategy involves building greater programmability, application awareness and end-to-end visibility into its Application Fluent Network. 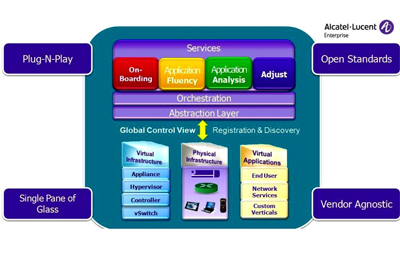 Alcatel-Lucent's Application Fluent Network, which is built on its OmniSwitch platform, detects virtualized applications and applies a profile-driven policy to enable a network to automatically adjust to virtualized traffic, such as virtual desktops, in order to meet service quality demands. The solution can combine individual user policies, the type of device and applications being used, with the knowledge of the entire network to dynamically adjust network access priority and bandwidth allocation, ensuring required service levels are met. CandIT Media, a digital media solutions vendor based in Belgium, is using Alcatel-Lucent’s OmniSwitch 6900 to create a “content aware” digital network that dynamically supports the large traffic peaks specific to media flows. In addition to providing a higher quality user experience, CandIT Media can deliver solutions to its customers at lower costs since the network is more efficient in transporting large files. "The high volumes of media traffic we deal with have a bursty nature that makes Ethernet switches suboptimal for their transport. By using off the shelf hardware and Alcatel-Lucent’s OminSwitch 6900, we were able to achieve and significantly improve Quality of Service by optimally tuning the transfer of media content which also resulted in a much higher utilization of physical components," stated Luc Andries, CTO, CandIT Media. In addition, Alcatel-Lucent announced that its OmniVista 2500 Virtual Machine Manager is now classified as VMware Ready. The OmniVista 2500 Virtual Machine Manager provides real-time and historical visibility of the enterprise data center network and the location of virtual components, such as virtual machines, within the network. This visibility of both the network and virtual applications coupled with the ability to provision and manage resources, enables the network to automatically make adjustments in response to changes in virtualized workloads within and between data centers. Increased programmability through a set of RESTful interfaces that enable applications, external controllers and orchestration platforms such as OpenStack and CloudStack to talk with Alcatel-Lucent’s OmniSwitch for greater orchestration and optimization of application delivery. Greater network recognition of applications through application profiling, and new application performance analysis of virtual machine connectivity to understand and react to network conditions on applications in real-time. Enhanced global control view through the addition of Plug-N-Play capabilities that allow each device in the network to be identified and brought into service automatically for improved decision making at the network node level. The global service provider router and switch market, including IP edge and core routers and carrier Ethernet switches, declined 5% in Q3 2012, both sequentially and from the year-ago 3rd quarter, to just shy of $3.4 billion, according to Infonetics' 3rd quarter 2012 (3Q12) Service Provider Routers and Switches report, which tracks and analyzes IP edge router, IP core router, and carrier Ethernet switch (CES) vendors and markets. Asia Pacific is the only region up in 3Q12 over 2Q12, albeit slightly, built on a 31% spike from Japan. In the router-only segment (IP edge and core routers), Cisco maintains its strong market share lead, but in a shakeup in the 3-way race for the next 3 leadership positions, Juniper took back the #2 spot from Huawei, which dropped to #4, while Alcatel-Lucent held steady in 3rd in 3Q12. Cisco, Juniper, Alcatel-Lucent and Huawei together account for 88% of total IP router revenue (edge and core) in 3Q12. "The performance of the router/switch market roughly reflects economic conditions, and true to form economic weakness in Europe, North America, and Latin America drove down IP router and switch revenue in the third quarter," notes Michael Howard, Infonetics Research's co-founder and principal analyst for carrier networks. "EMEA posted another negative quarter amid the ongoing fiscal crisis in Europe, and we may not see much of the usual final quarter budget flush, as it seems just as the European Commission gets closer to economic steadiness, more negative reports arrive. Although North America is showing positive economic signs, carrier router/switch revenue is down 2% from the year-ago quarter, and Latin America is slowing as many of the year-long projects in South America and Mexico wind down." Polaris Wireless has joined an indoor location technology market trial organized by the FCC's Communications Security, Reliability and Interoperability Council (CSRIC). The trial, which is taking place from November 15 through December 31 in the San Francisco Bay Area. involves the simultaneous testing of indoor location technologies from four leading companies: Polaris Wireless, Qualcomm, Boeing, and NextNav. The trial aims to identify technologies that can be deployed to enable PSAP’s (Public Safety Answering Points) to quickly and accurately locate emergency callers. Polaris Wireless is the only network-based location technology provider that is being tested in indoor environments. Polaris Wireless said one of the leading challenges for public safety responders is how to accurately locate an emergency caller indoors. This challenge will only grow as mobile subscribers increasingly come to rely upon their mobile devices for the vast majority of calls, both indoors and outdoors. The trial includes Polaris Wireless Location Signatures (Polaris WLSTM), a software- based RF Pattern Matching approach to the high-accuracy location determination problem, requiring no changes in the wireless device or in the wireless service provider’s base stations. Cincinnati Bell has standardized on Ruckus Wireless' Smart Wi-Fi solution to support its enterprise managed services, Wi-Fi hotspot and emerging metro public access businesses. The technology is being used for managed, campus-wide Wi-Fi such as local stadium venues, college campuses, and other hospitality establishments. Cincinnati Bell's commercial Wi-Fi services are managed through Ruckus ZoneDirector Smart WLAN controllers, located at Cincinnati Bell's central office. 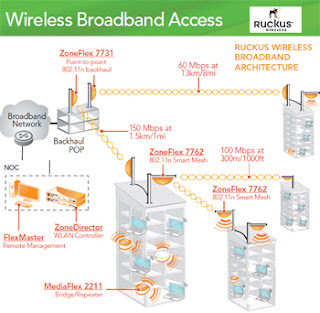 Ruckus noted that at one college campus in particular, Cincinnati Bell is using its Ruckus ZoneFlex 802.11n products to deliver an average download of 440 gigabytes per 24-hour period from only 100 students and their devices. Reliance Globalcom will upgrade its FLAG Europe-Asia (FEA) submarine network using Ciena’s WaveLogic coherent optical 100G networking solution. The 100G DWDM network follows a route that connects Egypt and Jordan. The installation uses Ciena’s 6500 Packet-Optical Platform equipped with WaveLogic coherent optical line interfaces. Financial terms were not disclosed. 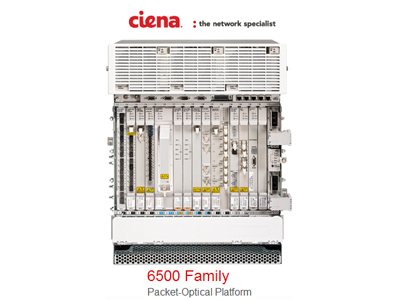 Ciena is also providing Reliance Globalcom with its advanced network management solution for streamlined service activation, robust fault management and comprehensive performance monitoring. Additionally, the deployment includes a wide range of professional services for this deployment via Ciena’s Specialist Services portfolio, including engineering, furnishing and installation (EF&I). Earlier this year, Reliance announced it is using Ciena’s 100G solutions to power its European network. In 2011, the companies announced two 40G deployments on the Reliance Globalcom network – one to support a 5,000 kilometer submarine link along two key routes connecting Japan, Taiwan, South Korea and Hong Kong, and the other to support a 6,400 kilometer ultra-long haul submarine link connecting the UK, Spain, Italy and Egypt. Ericsson launched patent infringement lawsuit against Samsung concerning technology that is essential to several telecommunications and networking standards. Ericsson said it took this action following nearly two years of negotiations which failed to reach an agreement. The complaint was filed in the District Court for the Eastern District of Texas, which is the district where Ericsson's US headquarters is located. Ericsson said Samsung previously licensed Ericsson's patents in 2001 and renewed in 2007, but its license has now expired. Ericsson noted that in 2011 alone, it invested SEK 32.6 b. (US$5.0 billion) in R&D. Its research has resulted in hundreds of patents related to GSM, GPRS, EDGE, WCDMA, LTE and 802.11. The company has more than 30,000 patents worldwide. Aricent is now offering OpenFlow and Software Defined Networking (SDN) software frameworks as part of its wireline communications source code portfolio. The OpenFlow Client software, along with Aricent's product lifecycle services, is designed to help telecom equipment manufacturers (TEMs) add OpenFlow and SDN to their products. Aricent said its OpenFlow Client software can be customized and deployed for both hybrid and pure OpenFlow architectures. The software can be used to develop OpenFlow and SDN controllers, as well in conjunction with Aricent other networking platforms. “OpenFlow is a tremendous opportunity for network innovation and we are really excited about its potential applications. Our membership with ONF further underscores our commitment, both to the technology and to our customers, towards cost-effectively co-creating cutting-edge next-generation networks,” said Sridhar Raju, Assistant Vice President and Head of the Wireline Communications Practice at Aricent.